Did you know that you can buy a Mercedes S55 AMG for less than the cost of one lease payment of a new S63? Now this one is a real peach. It is here for a very special use that we can talk about more here later. Let’s just say, hopefully its days of hard work are not over. 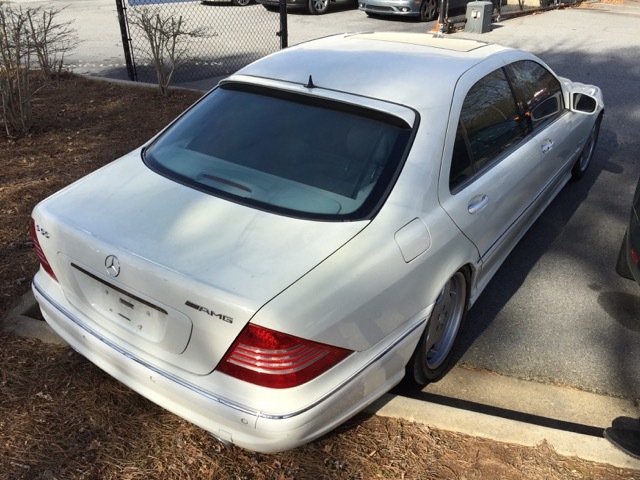 I just bought a 2002 Mercedes S55 AMG once-super sedan. This one has the 355 hp naturally aspirated V8 which gave way to the Supercharged version in 2003. It is generally Alabaster White with an interior the color of Ash Gray and human filth. 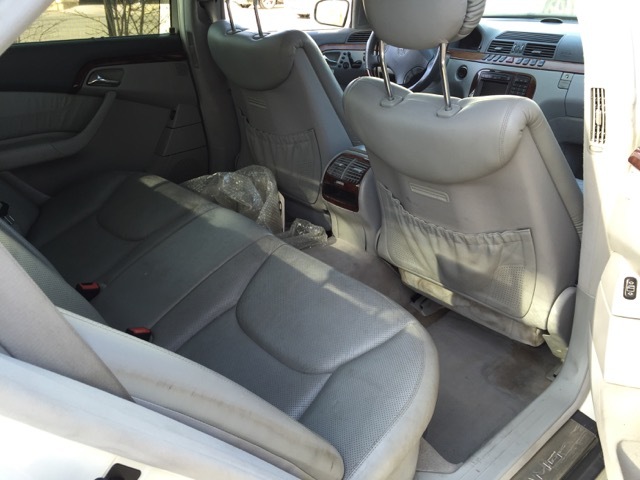 As you can see, like the washed up and wrinkled rock star that the car is – it is currently not without some significant service needs. It appears that several homeless people were likely evicted as consequence of my purchase. It is equipped with Keyless Go, most of the initial Parktronic system, and some other goodies. So here it is – not exactly a barn find but more of a left out in the sun, neglected, non-functional, sordid past, scarlet letter branded, derelict shell of what was once the coolest luxo-sports barge you could spend your Wall Street bonus on. This one was owned by a nice woman from Las Vegas who let her daughter drive it to Hollywood to become famous. Neither of those things worked out. She is still a normal person with less than 100 likes per selfie and the car broke down after developing some sort of an electrical problem. It was stored at a friend’s buy here/pay here lot. I found it on Craigslist Los Angeles. It was originally advertised for $5,000. The joint marketing effort of the mother and two daughters offered little beyond a poorly formed paragraph but I knew it had potential. 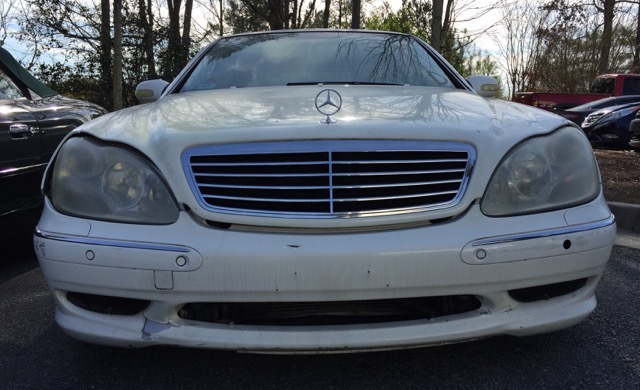 The proper combination of poor condition, challenged circumstance, uninformed seller, and reputation for unreliability compounded with the inadequate representation to create the perfect recipe for a car deal. I offered $1,100 and was turned down. They reposted it a couple of weeks later for $3,000. I offered $1,500 and they accepted. All I knew was that it ran, needed a suspension pump, and had some minor electrical issues. No pictures. At less than 1.5% of its initial value this takes the crown of the most depreciation that I have ever witnessed on a car. Of course there were a few things omitted from the description that I was offered. I am now the 12th certainly enthusiast owner of this fine specimen of German hand built engineering. 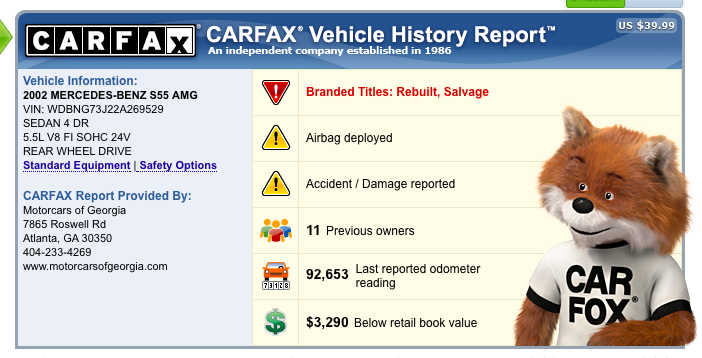 It was in an accident involving air bags, chaos, and frame damage in 2005 that bestowed upon it a salvage title. It also had another accident in 2007 for good measure. I was told that the electrical issue caused the driver’s door window to not roll up and one headlight to not work all the time. Upon speaking to the friend at the buy here/pay here lot I found that it also causes the dash to not work. So I think it has about 95k miles based on the discussion with the owner. Assuming that the bumper has not been hanging off of the car for 8 years it now appears that there may have been a third attempt at spacial coexistence with another vehicle or object. 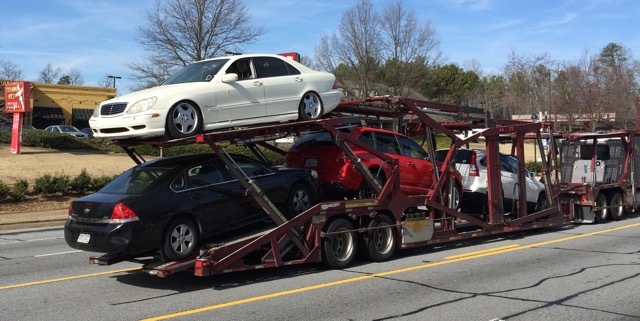 I had the car shipped here from California very inexpensively. The trucker decided it best to remove the plastic that serving as a window so it appears that some water got in. He also decided to add to the fin by losing the remote portion of the key. Fortunately, for some currently unknowable reason, the steering column lock and transmission lock were not functional. 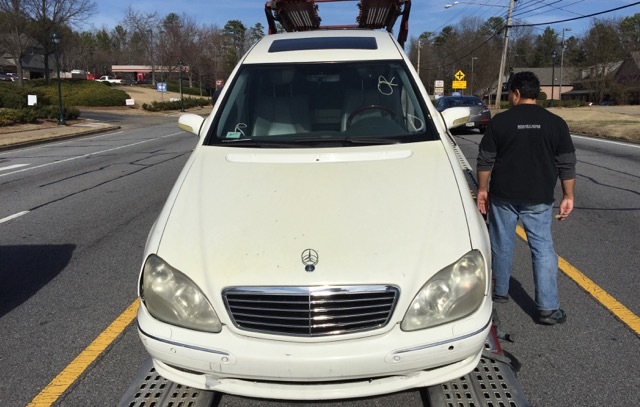 That meant that we could put the car in neutral, push, and steer the car into a place of temporary rest. Next week I will have a new key, new battery, and the chance to get the car started. Should be interesting! 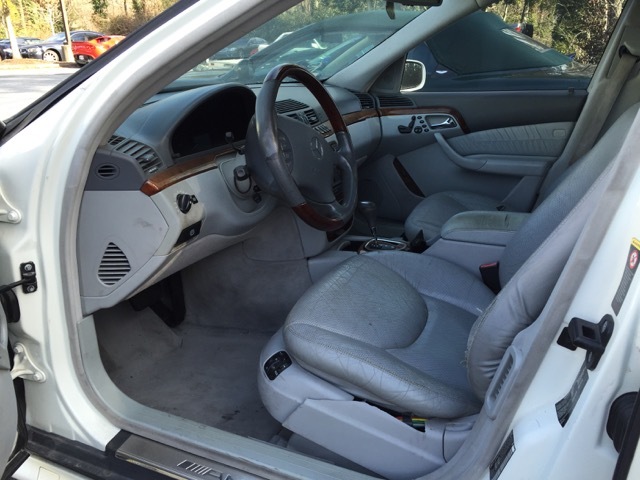 I seen your post about the 02 s55 amg, and was wondering how did it turn out? 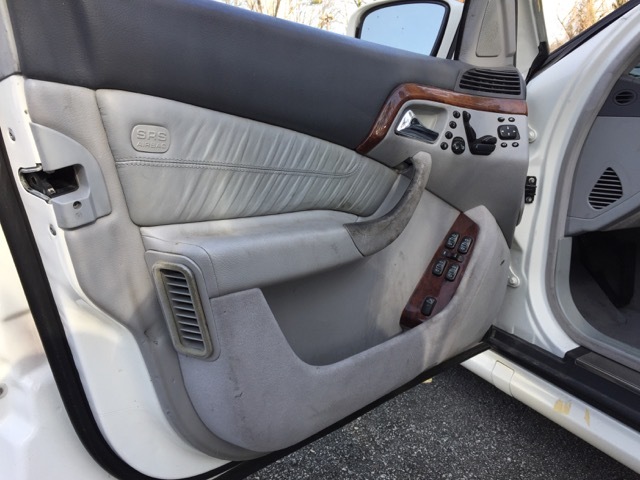 I recently purchased one 02 s55 amg and been restoring ot little by little and what I have found out is that parts are really hard to find for this car. Did you have the same peoblem as I do?